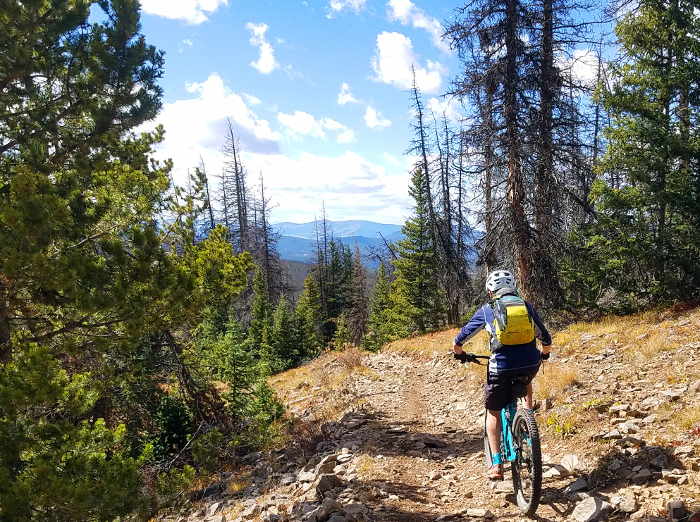 Focused on trails near Gunnison Valley, TrailQuest originally began as a challenge to ride the 750+ miles of non-Wilderness trails that encompass a specific area. 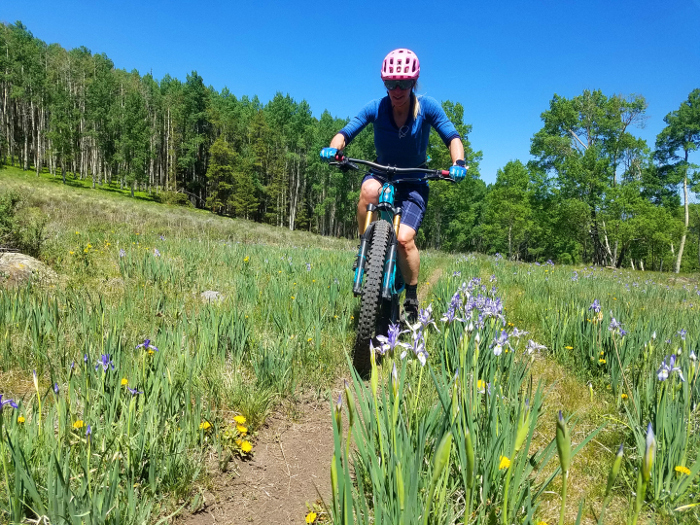 Since then, other smaller challenges have been created, like a Bike Week TrailQuest, a 4th of July Week TrailQuest, and an Outerbike Week TrailQuest. But the ultimate challenge is still the 750+ unique miles of non-Wilderness trails, which is likely a multi-year goal for most people. Over the last two years, Frank and I have been doing our best to rise to this TrailQuest Challenge. Admittedly, we’ve had a lot of hard days during our explorations. But we’ve also had more great rides than not. Some of them were so good we would like to add them to our “need to do every year” list. So, what are these rides? That’s the goal of this series of articles, with this first one focusing on the Needle Creek / Cochetopa Hills / Sargents Mesa region. In general terms, this region runs south of Sargents and US 50, west of Monarch Pass, and east of CO 114. 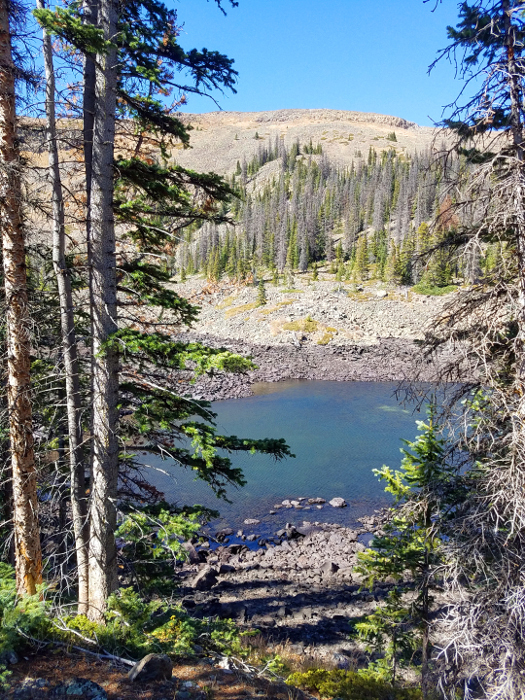 Needle Creek and Cochetopa Pass run along the western edge, Tank Seven to the east, and the Colorado Trail is the spine that connects most of these trails together, on the southern edge of the zone. Those that travel through this lesser known area are greeted with some fabulous scenery in the Cochetopa Hills and Sargents Mesa. This Needle Creek Region is different from many other areas near the Gunnison Valley. Even though much of the area is forested, not a lot of water travels through here, so this region tends to be very dry. 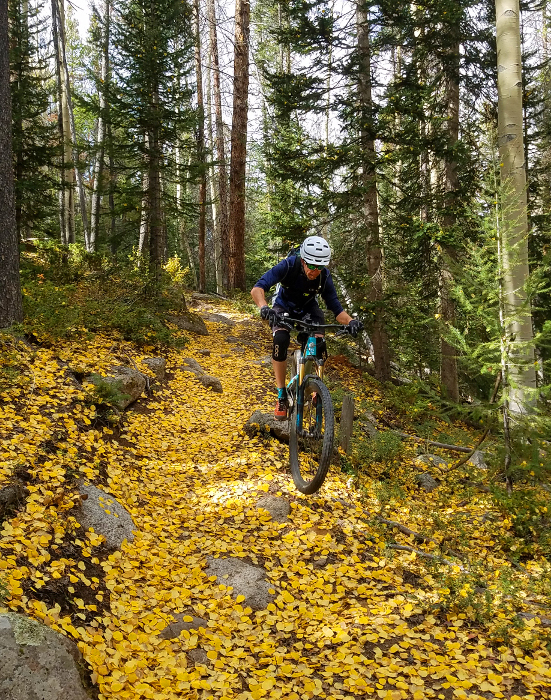 You also won’t find crowds in this zone, despite the fact that many of the trails in this area are used more often by motorized dirt bikes than mountain bikes. 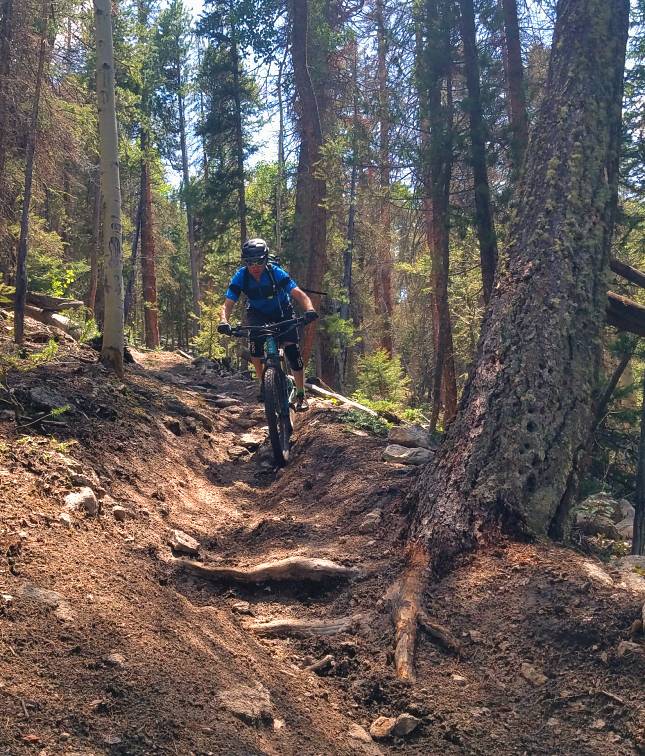 Other than the Colorado Trail segments, you’re likely to be alone on the trails all day long. And if you like relatively technical trails, you’re bound to like riding in this area. 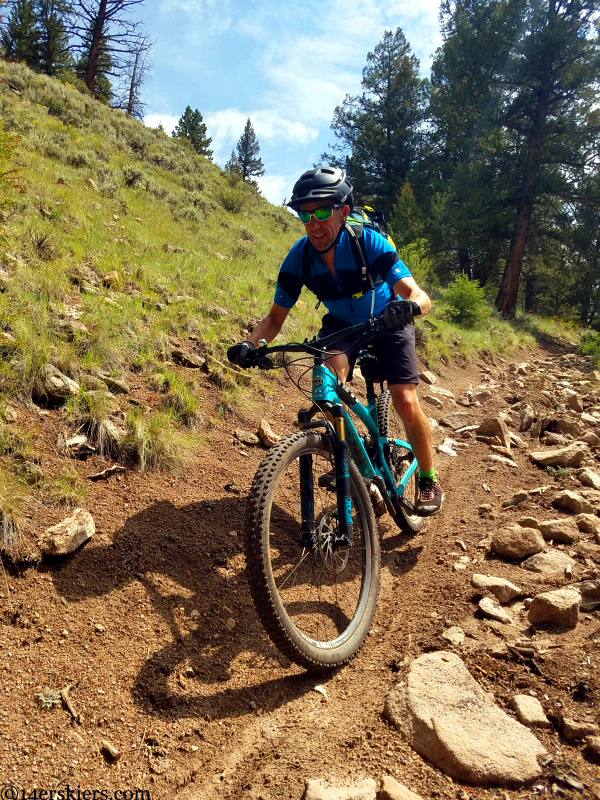 Three of my favorite mountain bike rides in the Needle Creek region include Milk Creek to Long Branch, Baldy Lake to Dutchman Creek to Hicks Gulch, and Right Hand to Razor Creek to Barrett Creek. 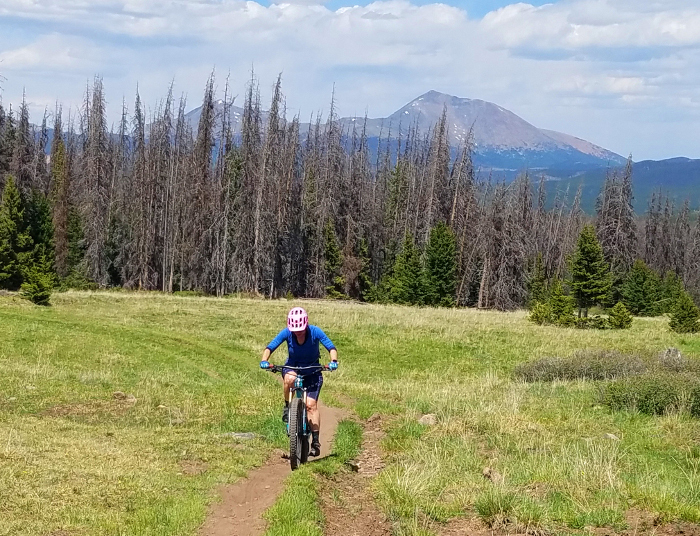 This ride begins with a lovely ride through a lush forest, opens up to a mesa with expansive views, capped off with a long technical descent. We first started our ride at Long Branch Station, just southwest of the small town of Sargents. We then ascended Big Bend Trail for 1.2 miles before turning left onto the Milk Creek Trail 474. Here, the trail started to become lush, with occasional meadows full of wildflowers, especially wild irises. After another 1.7 miles, of this we turned right onto Milk Creek Trail 625 which continued to be equally beautiful. But, all that changed about 3 miles into our ride, where the pitch steepened, “baby-head” rocks covered the trail, and a serious hike-a-bike ensued. We wondered how long this section would last. But, it wasn’t too bad. I think we were back in the saddle after 15 or 20 minutes. Milk Creek eventually met up with some 4WD roads which we followed until we intersected the Colorado Trail. Once on the Colorado Trail, we headed west and were quickly greeted with the expansive views offered by Sargents Mesa. We were still climbing in through this segment, but it hardly felt like it with such scenery all around! We passed by Big Bend Trail (an alternative descent for a shorter loop) and shortly after trail then once again retreated into the forest. But, the best part still awaited us – the 5.7 mile descent down Long Branch Trail. A short ride down a dirt road completed our clockwise loop and brought us back to Longbranch Station. I mentioned before that this area is dry, yet this route passes by two of the extremely sparse lakes in the region. 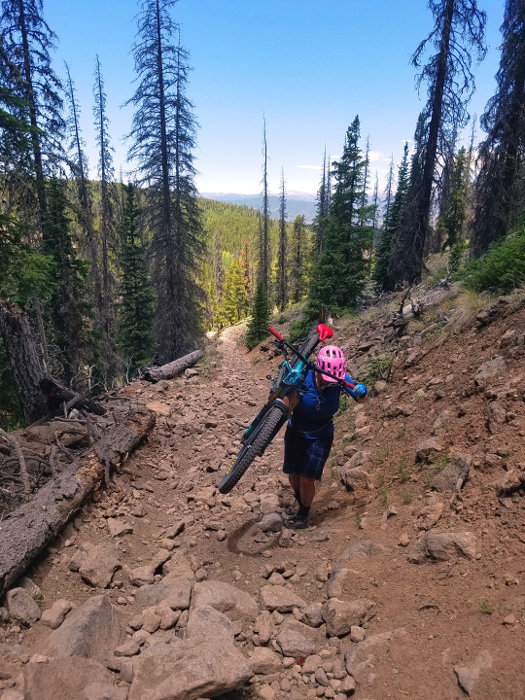 After a short segment on the Colorado Trail, the ascent is then rewarded with a fast and fun descent, probably the most difficult in the Needle Creek region. 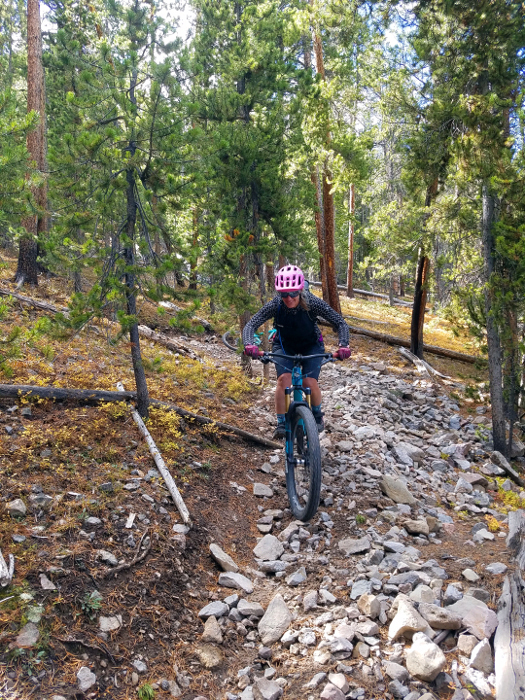 For this mountain bike ride, we again started at Longbranch Station, heading up the Baldy Lake Trail. Although steep Baldy Lakes is a bit less loose than some of the other trails in this area, so it made for a descent ascent. But the real icing on the cake of the ascent was passing by the beautiful Baldy Lakes. 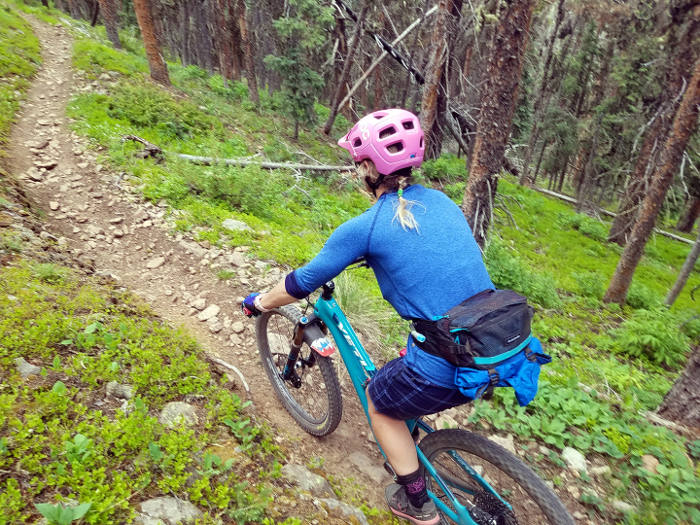 After about 6 miles, we then intersected with the Colorado Trail, where we traveled another 3 miles west over cross-country style terrain and through eerie forests largely damaged with beetle kill. We then enjoyed the fast, yet loose and technical, 3.6 mile descent of Dutchman Creek Trail. After crossing a creek, we turned right to ascend on Hicks Gulch Trail, another beautifully forested route. This brought us up to a ridge where we regained the Badly Lakes Trail where we had been earlier during that day. A descent of a portion of Baldy Lakes Trail back to Longbranch Station completed our lovely lollipop loop. Unlike the other two routes listed for the Needle Creek region, Right Hand to Razor Creek to Barrett Creek doesn’t have one large ascent. Rather, it has a few different and descents scattered throughout the ride. 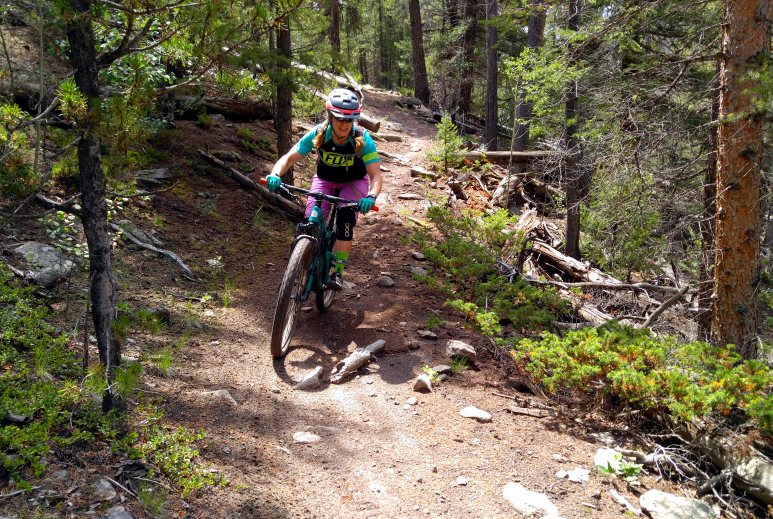 But, this flowy route is a great intro to the Needle Creek region with some fast and fun descents in the mix. We began our ride at Needle Creek Reservoir, first climbing up Right Hand Trail. After about 2.5 miles, we began a short descent, and continued ascending again. A mile later, we found ourselves enjoying one of the longer descents of the ride. Right Hand Trail dropped us into Razor Creek Trail which we followed a short ways to Middle Razor Creek, descending a little further. We then began ascending again on North Gulch Trail. This long climb passed through scenic fields and forests, making the ascent seem less grueling than it actually was. Nevertheless, some hike-a-bike action was needed to finish the climb reaching the high point of the day. The next descent lasted 3 fun miles and brought smiles to all of our faces as we rode north on Barrett Creek Trail. One last gentle climb and descent on Left Barrett Trail brought us back to Right Hand Trail, completing our clockwise loop. Any of these mountain bike rides, I would gladly do over again! 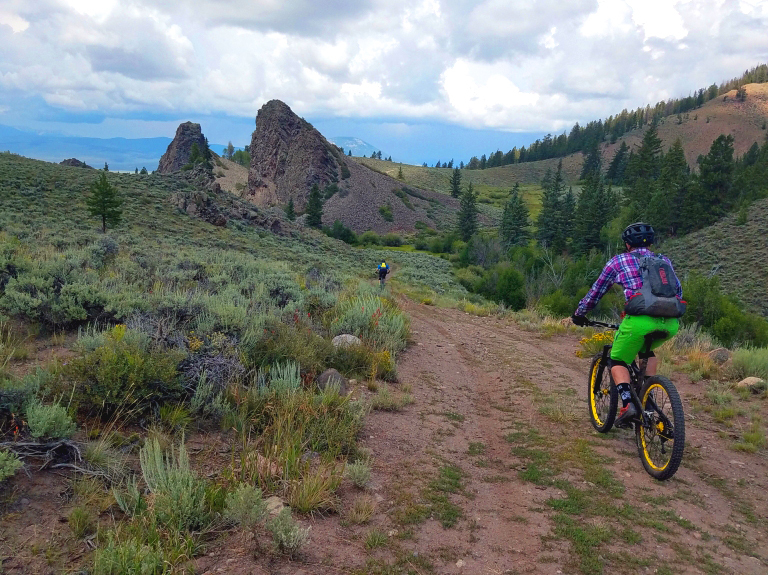 The Needle Creek region has a number of fun trails that are definitely worth checking out. So, break away from the norm and try something different. You may just find you like it!